Thunder and lightning that is rarely seen in Southern California swept in the night before the Orange County Championships. But, overcoming wet and what became sloppy conditions - the boys of Dana Hills provided all the thunder needed to overwhelm the competition to claim another Orange County Team Championships! Afterward, Mission Viejo's girls provided enough lightning to hold off the youth of Canyon of Anaheim to capture take the trophy back home this year! 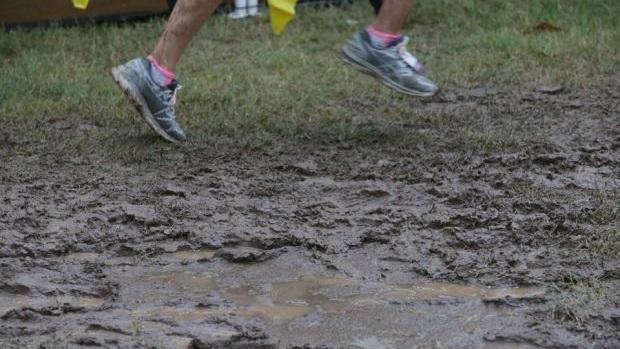 Many saw the effects of the slick and slippery course conditions throughout those Sweepstakes races. One particular U-turn with about 800 meters to go claimed a number of victims in those races where any runner that takes the sharp turn, risked falling and having to rebound to the finish. At the conclusion of those races, meet management made the decision to shut down the remaining sophomore and junior varsity level races. But, Dana Hills boys reminded everybody why they have been one of the more dominant programs over the past three decades with a jaw-dropping performance that featured four in the top seven with their 5th finishing at 13th overall. We had them as the overwhelming favorite but have to admit that we did not see them scoring a 115+ point victory over the 2nd place team! Most impressive was their 20-second scoring spread. Simon Fuller led the onslaught with his 2nd place finish at 14:57.5 but within the next 11 seconds, Carrick Denker, Cole Stark, and Garrett Hough came to join him in the chute. Hayden Stein came across at 15:13 while sophomore Brandon Pizano crossed at 15:22 and finished ahead of most of the other squad's #2 runner! El Toro held on over Trabuco Hills for 2nd place, 149-153. Woodbridge was a little 'off' from what we've seen and took 4th at 208 points, just ahead of Santa Ana at 211. Meanwhile, Newport Harbor's Alexis Garcia was an upset winner. He bounced back from an off race at Clovis the previous week, to finish ahead of Fuller at 14:53.6. Trabuco Hills' Josh O'Neill also came back from a frustrating race at Clovis to take 4th at 15:03.8. Those two bookended Fuller and Denker from Dana Hills. On the girls' side, we had Mission Viejo's girls as slight favorites and sure enough, they held off a young and talented Canyon crew, 66-72! MV's Kelli Hines came through as the favorite with a 17:29.9 victory, ahead of Canyon freshman Emma Hadley at 17:40.2. Emma Hicken, Morgan Calcagnie, Sophie Mendelson and Lauryn Simons earned the county team title in their senior year but Canyon gave them all they could handle. For Canyon, aside from Hadley's performance, sophomore Sarah Paino truly stepped it up for her squad in taking 4th overall (17:51.4). Capistrano Valley, led by Carly Corsinita's 3rd place finish (17:47.7) took 3rd place, while El Toro finished just ahead of Fountain Valley. San Clemente's Hana Catsimanes was fighting for 3rd until she fell victim to that unforgiving muddy turn with 800 to go. She took 10th place but still led her Tritons to finish ahead of the girls from Dana Hills.